This 30-year-old woman was referred by another patient. She was not happy with her profile. She wanted more chin projection and better contouring of the neck angle. It was a family trait to have fullness in the area underneath the chin. She had had braces on her teeth in the past. Her teeth had normal closure (occlusion). She had good facial proportions except for poor chin projection. 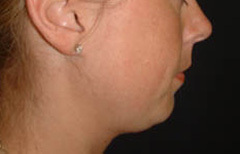 In addition, she had excessive fat in the upper neck area under the chin. We discussed the different options to improve her chin projection. Rather than cutting the bone and bringing the chin portion forward, I recommended we use a chin implant to obtain better chin projection. In addition, I recommended we do a neck lift with removal of the excessive fat and contouring of the neck muscles (platysmaplasty). Since she had good elasticity of her skin and was young, there was no need to remove skin. In July 2006, she underwent contouring of the neck along with placement of a chin implant through an incision underneath the chin and around the earlobes. 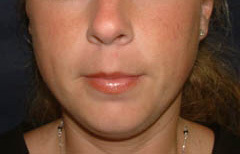 A medium size implant was placed for chin enhancement. Liposuction of the neck was performed in addition to removal of fat deep to the muscle and tightening of the muscle in the midline. Photographs taken six weeks after her surgery show her outstanding result. 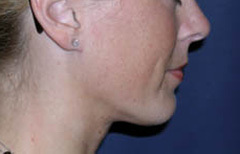 One can see improvement in the projection of the chin as well as the neck. The addition of the implant gave her better balance of the face.